I displayed the bike at a flurry of events during what has since become known as “The BEHEMOTH Epoch” – I was based in Silicon Valley for about 3 years, building the new machine, taking breaks to exhibit at trade shows, companies, and special events. 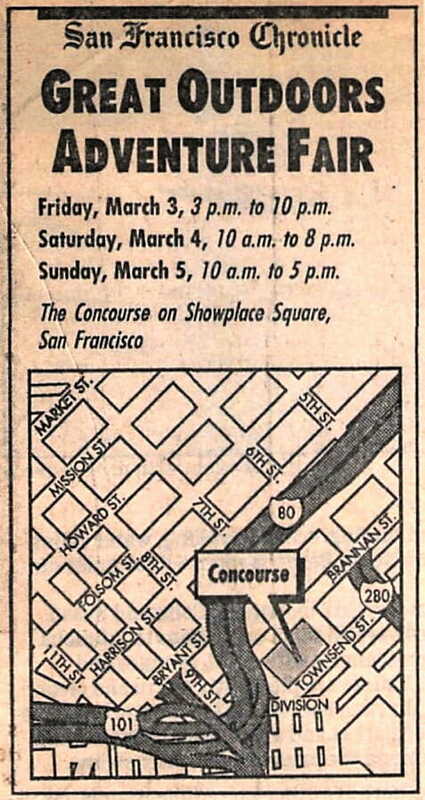 This one was rather fun, sponsored by the San Francisco Chronicle, and there was a bit of build-up in the paper prior to the show itself. The writer of the second piece below was quite a bicycling celebrity at the time… holding the women’s transcontinental record of just over 10 days. I recall that we joked about being at opposite ends of the cycling spectrum! The version on display was the cusp between Winnebiko II and Winnebiko III (later named BEHEMOTH), far from being complete. I didn’t roll out of the lab until sometime in 1991. 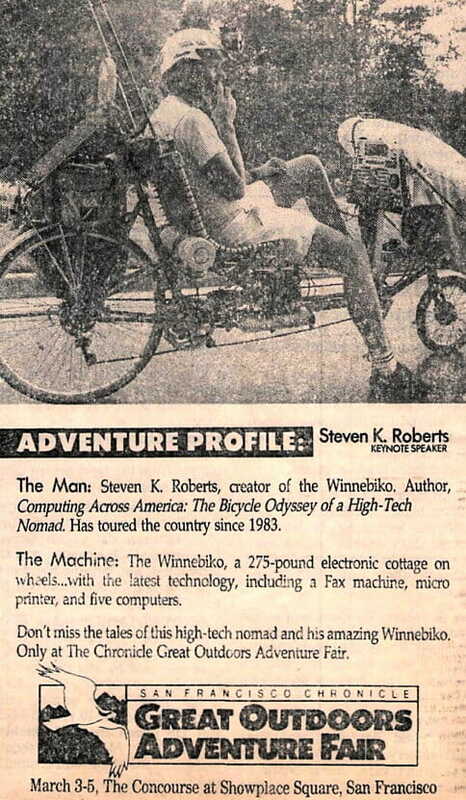 In 1983, Steve Roberts left the trappings of his suburban home in Columbus, Ohio to seek adventure, romance, computers, writing and change. After more than 16,000 miles of transcontinental exploration and two versions of a unique electronic bicycle called the “Winnebiko,” this 36-year-old nomad is currently cooling his heels in Silicon Valley, working on yet another invention that he’ll take on the road in June. His bicycle is both his home and his transportation. A 275-pound “megacycle” built over a standard eight-foot recumbent bicycle, it has a four-foot kiddie trailer in tow. Added to this basic framework is a 36-speed, computerized, automatic transmission, along with a regenerative braking system that recharges batteries during long descents from mountain peaks. “Turning all that energy into heat on brake pads has always seemed like a big waste,” explains Roberts. 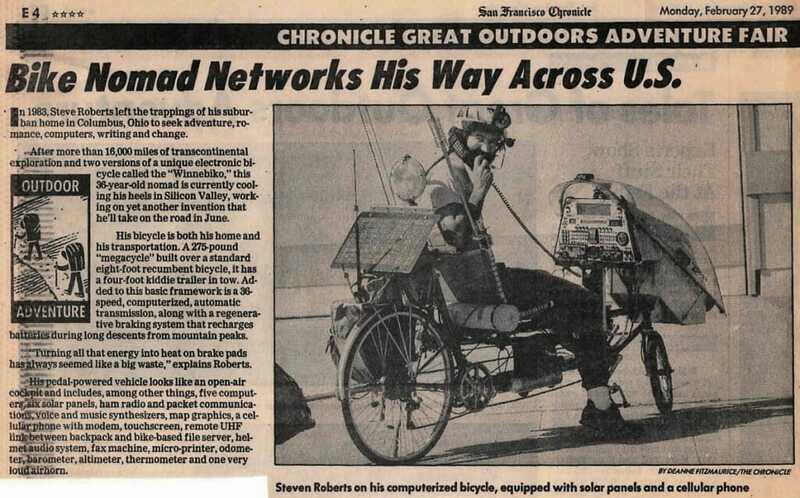 His pedal-powered vehicle looks like an open-air cockpit and includes, among other things, five computers, six solar panels, ham radio and packet communications, voice and music synthesizers, map graphics, a cellular phone with modem, touchscreen, remote UHF link between backpack and bike-based file server, helmet audio system, fax machine, micro-printer, odometer, barometer, altimeter, thermometer and one very loud airhorn. Roberts and Winnebiko III will be at the Great Outdoors Adventure Fair. He will deliver the keynote address on Friday at 6:30 p.m., and conduct clinics explaining his bike on Friday, from 3 to 5 p.m.; Saturday, 5:15 to 8 p.m. and Sunday, 10:30 a.m. to 2:30 p.m.
He’s just released a book, Computing Across America: The Bicycle Odyssey of a High-Tech Nomad, which covers his unique travels and electronic tinkerings. His original set-up cost $8,000, including accessories, but the value of the modified Winnebiko III is considerably more. When asked to estimate the value of his current rig, Roberts politely refused. Although this electronic cottage on wheels can transmit information around the world, Roberts has to deal with the down-to-earth realities of daily existence such as where he’ll bed down for the night, and what his next meal will be. Instead, he relies on a “hospitality database” of more than 5,000 contacts that he’s met through computer and ham radio networks, bicycle organizations and friends. Roberts claims that about one-third of these contacts result in invitations that can last hours, days, weeks and even months. He admits that he’s “never taken an athletic approach” to the endeavor, but this time he’s vowed to turbo-charge the engine with the help of a personal trainer, Greg Thurston of Atherton (who also will be at the fair). With the exception of a base office in Indiana that handles traditional mail, bank accounts and permanent records, Roberts is living proof that it’s possible to run a successful freelance writing and consulting business virtually anywhere, and have a great time doing it. Roberts and Maggie Victor, his 36-year-old traveling companion for the last 6,000 miles, will leave this summer on a shakedown mission before venturing to Europe. They have extended an open invitation to would-be nomads who are itching to “trash their existing lifestyle” and share this wanderlust. 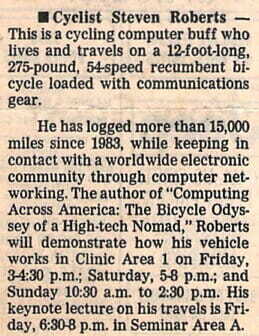 Those who have the appropriate communications equipment can contact Roberts at one of his Computing Across America access information handles: GEnie: WORDY CIS: 72757,15 Packet: N4RVE WA40NG UUCP: wordycup.portal.com. Elaine Mariolle is a sports consultant, public speaker, and co-author of The Woman Cyclist. A resident of Berkeley, she won the 1986 Race Across America and currently holds the women’s transcontinental record of 10 days, 2 hours, and 4 minutes.